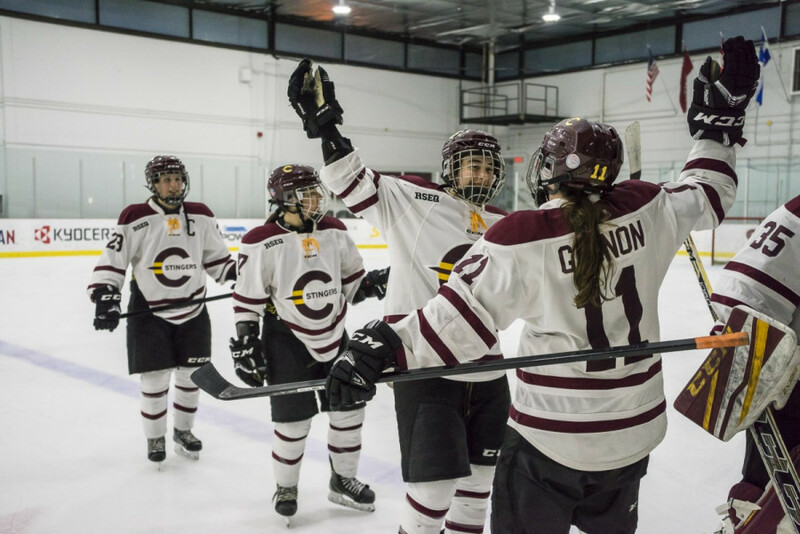 In a preview of their first round playoff series, the Stingers women’s hockey team squared off against the University of Ottawa Gee-Gees this afternoon at Ed Meagher Arena. In the team’s last Réseau du sport étudiant du Québec regular season game, it was the visiting Gee-Gees that got off to the hot start. Six minutes into the first period, Ottawa forward Sara Lachance snuck a loose puck past Concordia goalie Alice Philbert, who got the nod in nets over regular starter, Katherine Purchase. Ten minutes later, Julie Lévesque collected a rebound in front of the Stingers net and doubled the Gee-Gee lead. At that point, the game appeared destined to end the same way three of their four meetings this season did; with an Ottawa win. Despite being down two goals, the Stingers didn’t look like they were being outplayed. They were outshooting the Gee-Gees and continuously kept the pressure on their opponents’ defense. That sustained offensive pressure finally paid off towards the end of the second period when forward Audrey Belzile scored her eleventh goal of the season, assisted by Marie-Pascale Bernier. With that goal, Belzile had scored in six of the last seven Stingers games. It also edges her one goal ahead of Lidia Fillion for the team lead in goals. Belzile’s goal seemed to light a fire under the Stingers, and that eventually led to an equalizer by assistant captain, forward Claudia Dubois. Both teams had few chances to score before the end of regulation, and for the second time this weekend, the Stingers were headed to overtime. One overtime period of four-on-four hockey could not settle their differences, so the teams went to a second one, this time, of three-on-three hockey. Two minutes in, Sophie Gagnon ended the game with a goal—a fitting end to end a fourteen-win campaign. After losing to the Université de Montréal Carabins on Friday night, standings were no longer a question. The Stingers are locked in at second place behind the Carabins. The first round of the RSEQ playoffs begin Thursday at 7:30 against the Gee-Gees at Ed Meagher Arena.